Can you tell me what the colours of the benchtop and cabinets are. Thanks. Hi Coral. 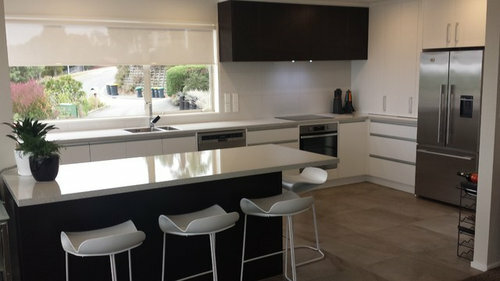 The benchtops are a laminate - Laminex Pure Mineralstone Diamondgloss, and the cabinetry is Dezignatek White Satin and Prime Melamine Prime Wenge. space between kitchen wall and benchtop - how do I fix?